Adding date and time stamps to emails may seem obsolete, as your email client and mail servers are anyway adding these stamps to email headers during the email delivery process. However, for your further email processing and handling needs, especially when dealing with public or shared mail folders, Bells & Whistles allows you to automatically add date and time stamps on every outgoing email. 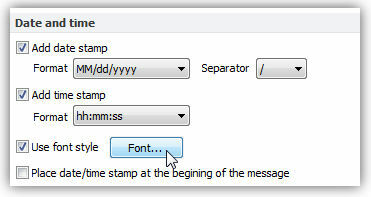 To add these stamps, simply open the Bells & Whistles configuration screen (under Outlook -> Tools) and enable the date and/or time stamp options from the "Other Options" section. Once these options are enabled, Bells & Whistles will auto-insert stamps within the email message content, every time when you will send out a new email, reply or forward message. To further customize the look of these stamps, you can choose the desired time & date format and you can format the font style of these stamps. Below you can find more information about some of the most important features of the Bells & Whistles add-in for Outlook. You are welcome to download a free evaluation copy of the Outlook add-in, yours to use for 20 days, with no purchase obligation. Purchasing and registering the Bells & Whistles add-in for Outlook. Automatically put people I reply to in Contacts. How to use predefined Outlook email templates on Outlook messages. How to always archive attachments when attaching files to Outlook emails. How to manage or remove Outlook add-ins.